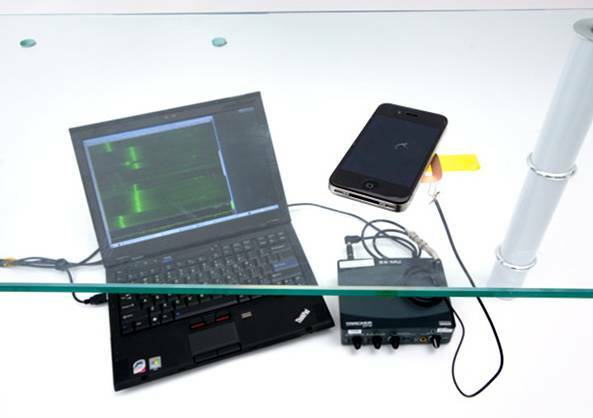 Researchers have broken the encryption schemes used in mobile money transfers by “sniffing” electromagnetic radiation from smartphones. The work, by researchers from the Check Point Institute for Information Security at Tel Aviv University and the University of Adelaide, offers further evidence that TEMPEST-style side channel attacks are no longer just the preserve of Mission: Impossible and three-letter spy agencies. Crypto software used to protect sensitive data on mobile phones uses a digital signature algorithm called ECDSA (Elliptic Curve Digital Signature Algorithm). Boffins found that this algorithm unintentionally exposes the cryptographic keys, when used on a mobile device, because of changes in electromagnetic radiation, as well as in power consumption, depending on the data being encrypted. In a paper, titled ECDSA Key Extraction from Mobile Devices via Nonintrusive Physical Side Channels, the researchers (Daniel Genkin, Lev Pachmanov, Itamar Pipman, Eran Tromer, and Yuval Yarom) explain how secret decryption keys in might be harvested through a passive attack using low-cost hardware followed by automated number crunching. We show that modern cryptographic software on mobile phones, implementing the ECDSA digital signature algorithm, may inadvertently expose its secret keys through physical side channels: electromagnetic radiation and power consumption which fluctuate in a way that depends on secret information during the cryptographic computation. An attacker can non-invasively measure these physical effects using a $2 magnetic probe held in proximity to the device, or an improvised USB adapter connected to the phone's USB cable, and a USB sound card. Using such measurements, we were able to fully extract secret signing keys from OpenSSL and CoreBitcoin running on iOS devices. We also showed partial key leakage from OpenSSL running on Android and from iOS's CommonCrypto. The research shows that hackers might be able to circumvent cryptographic security for mobile devices using a cheap and straightforward attack. Miscreants could steal sensitive information by using a simple probe that measures electromagnetic radiation. Alternatively, hackers could harvest info after tricking prospective marks into hooking up an improvised adapter to a phone’s USB cable. Neither technique necessitates any coding skill s as such. The electromagnetic signal is measured using a magnetic probe, and digitised by a sound card, a software-defined radio, or a lab-grade sampling card. Extracted signals are then run through a digital signalling processing rig in order to recover keys. “Our methodology includes physical signal acquisition from mobile devices (phones and tablet), signal processing for signal extraction and enhancement using Singular Spectrum Analysis, and a lattice-based algorithm for recovering the secret signing key by aggregating partial information learned from many randomised signing operations,” the researchers explain. Mounting a crypto attack on an iPhone 4 using an improvised EM probe. ECDSA is used in many applications such as Bitcoin wallets and Apple Pay. That means these applications, especially those that rely on vulnerable versions of OpenSSL, CoreBitcoin or iOS, might expose their users to low-cost physical attacks, leading to theft of signing credentials and subsequent unauthorised transactions or false authentication. Smartphone users of Bitcoin wallets – or even Apple Pay accounts – are, therefore, at risk of potential attack.